Hi Everyone ... I had to interrupt this break to introduce you to the 800th follower of Reduce Footprints. Yep ... we've grown! WhooHoo! If you're not familiar with Our Tiny Earth, you're really missing out. It's a terrific blog about the journey to sustainability. Recently Scott invited readers to weigh in on how they are promoting the local economy and the environment. It promises to be a great discussion and I encourage each of you to head over and leave your comments ... because ... Reduce Footprints' readers have a lot of valuable information to share. We now return to our regularly scheduled break! Today I have the pleasure of introducing you to Vaishali and her wonderful blog, Holy Cow! Vegan Recipes. Vaishali, born and raised in Bombay, India, now lives in a suburb of Washington, DC. Many of her recipes are inspired by the tastes of home. For example, My Dad's "Not-Mutton" Mushroom Curry is based on a dish her father prepared each Sunday for her family. Baked Samosas with a Chickpea Stuffing is inspired by "Thursday's selection" in the cafeteria of her first job. Other recipes are simply foods which Vaishali loves like Can't-Have-Enough-Basil Pizza, Savory Avocado and Herb Tortillas and Whole Wheat Vegan Pancakes. Most recipes come with a story ... little glimpses into how the recipe was created or what Vaishali was doing when she thought of it. Similar to a high-quality cookbook, each recipe includes lovely photography, compliments of Vaishali's husband, Desi. When I visit Holy Cow! Vegan Recipes, I am reminded that food isn't simply about ingredients and methods ... it's about a whole experience ... about places we've enjoyed, childhood memories and the events which inspire us. I'd like to thank Vaishali for "coming by" and sharing one of her special dishes with us. Aloo Parathas are popular Indian eats, but restaurant versions are usually not healthy because they use refined flour and tons of oil or ghee. My Overstuffed Aloo Parathas are a healthy vegan version made with whole wheat and just a touch of oil, but they taste decadent enough to qualify as true comfort food. Aloo Parathas were the first meal I made for Desi, my husband. I was a new cook at the time and he jokes to this day that I took a whole day to make them. But don’t worry—this recipe won’t take you more than an hour, including prep. Do pay attention to the technique, because that’s half the battle won. Place all the ingredients except water in a large bowl or in the bowl of a stand mixer. With your fingers, rub the oil into the flour until the flour looks grainy. This step will help make your parathas flaky. Add a little water at a time and knead into a fairly stiff but pliable dough. Place in an airtight box and set aside for at least half an hour to let the dough relax. 6 medium-sized potatoes (use any kind. I used red bliss this time). Boil the potatoes until tender and then mash them as smooth as possible. Lumps will make it difficult to roll the parathas. I also try to keep the skins on, but if they don’t break up easily just discard them. Mix all the ingredients in a bowl. Divide into four portions. The portions may seem large, but remember these are overstuffed aloo parathas—they are really tender and flaky with a thin covering of dough and lots of delicious potato inside. Divide the dough into four portions. Take one portion, divide it further into two, and roll each into a smooth ball. Using a little flour, roll each ball into a circle, about 4 inches in diameter. The edges should be slightly thinner than the center. Place one portion of the stuffing in the center of the round, leaving a ½-inch rim around the edges. Brush some water around the edge and place the second round on top. Press down with your fingers to seal the edges tightly. If you have air bubbles, use the sharp tip of a kitchen knife to poke a hole or two in the top round to remove the air. Using some more flour (not too much), roll the paratha gently into a slightly larger round, about 6 inches in diameter. If some of the filling squirts out, just repair with your fingers, pat some flour on it, and keep going. Small mistakes won’t ruin your paratha, so don’t fret. Repeat for the remaining three portions of dough. Heat a nonstick or cast-iron griddle over medium-high heat. Place a paratha on it and let it cook until golden-brown spots appear on the underside. Flip the paratha and brush some of the garlic olive oil on top. Once golden-brown spots have appeared on the underside, remove and keep warm by wrapping the paratha in a kitchen towel. Serve very hot with some chutney, any spicy Indian curry, or just on its own. Thanks, again, to Vaishali for that delicious recipe. I can't wait to try it! If you have a vegan recipe which you'd like to share, please send it to me HERE. And for all the recipes we've shared so far, be sure to visit our recipe page using the tabs at the top of this blog ... or by clicking HERE. It's the first Friday of the month and that means it's time to share another delicious recipe! So ... please be patient until Monday while the chef creates something wonderful for you. It promises to be FABULOUS! It's the first Friday of the month and that means it's time to share another delicious recipe with you. So why does a blog about "green" living post vegan recipes? Simply put, it takes less natural resources to produce one pound of plant-based foods versus one pound of animal-based foods. Consider this ... say, for example, that we have one acre of land. We decide to grow vegetables. So we plant our seeds, water the plants and then harvest the veggies. Now let's say we decide to raise beef on that acre of land. The cattle will quickly eat anything growing on the one acre so we'll need to acquire more. That means we'll either need to buy it from a farmer who grew it on his one acre of land or we'll need to buy another acre of land to grow feed on. The cattle will need water to drink ... and their feed will need water to grow. So already we're using more land and water to produce meat. And that doesn't begin to address the additional pollution of raising animals versus that of raising veggies. Eating a plant-based diet is the simplest way to reduce our carbon footprint. 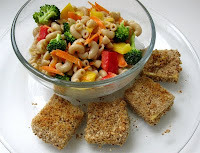 This month's recipe comes from one of my new favorite blogs, The Vegetarian (Who Hates Tofu). Michele, the author and "head chef", has put together a beautiful blog full of wonderful recipes. My first impression of the blog was how clean and fresh it is ... in addition to the Home page, there is a page of recipes and a page of Michele's Favorites (links to her favorite books, movies and blogs). The Recipe page includes such tasty treasures as Cauliflower Steak and Tortilla Soup. On the Home Page, I found a list of keywords and the word "breakfast" was listed. For me, creative and delicious vegan breakfasts are a challenge. So I was interested to see what I'd find. Michele offers several dishes including Cinna-Mini Pancakes, Carrot Cake Muffins and Mochi Breakfast Bites. Mmm! If you are interested in incorporating more meatless meals into your diet, then you'll want to bookmark The Vegetarian (Who Hates Tofu) and visit often. Michele has kindly agreed to share one of her recipes with us. It is perfect for this time of year with all the colors and flavors of fall. I can't wait to give it a try! Combine almond milk and vinegar in a small bowl and set aside. Meanwhile, in a blender, puree apple. In a large mixing bowl, whisk together pumpkin and apple puree till well combined. Stir in oil, almond milk, sugar and vanilla extract. Sift in flour, baking powder, baking soda, cinnamon, nutmeg, ginger, cloves, and salt. Mix well. Pour into a lined cupcake pan (fill to the top). Bake at 350 for 24 minutes, until a toothpick inserted in the middle comes out clean. Cool completely before decorating. Beat Earth Balance until creamy, about a minute. Add sugar and cinnamon and beat for 2 minutes. Add vanilla, maple syrup and almond milk. Beat until light and fluffy, about 5 more minutes. Top each cupcake with a dollop of frosting & enjoy! Thanks, again, to Michele of The Vegetarian (Who Hates Tofu). If you have a vegan recipe which you'd like to share, please send it to me HERE. And for all the recipes we've shared so far, be sure to visit our recipe page using the tabs at the top of the page ... or by clicking HERE. It's that time of year again ... when the veil between the living and the dead becomes thin and spirits can be seen walking the earth. Shadows come alive and threaten to grab us ... witches fly and ghosts materialize before our very eyes. In other words ... it's almost Halloween and time for our annual "Spooky" post! Question: What's the ratio of a pumpkin's circumference to its diameter? -Are you going to carve a pumpkin ... or decorate one? If you haven't grown your own, buy one from a local farm or farmer's market. Use every part of the pumpkin. The seeds can be toasted and eaten as snacks ... they are healthy and taste great. One can toast them in the oven or in a dry frying pan on the stove. When they are brown, carefully remove them (they are very hot at this stage) and immediately sprinkle your favorite seasoning on them (mine is creole seasoning but kids might prefer something less spicy ... like a little salt). Not in the mood for toasting seeds? Try tossing them, either wet or dry, into the yard for birds ... they love them. Use the flesh of the pumpkin to make a pie, soup, cookies or flan ... it might require a bit more sugar than the smaller, pie pumpkins. After Halloween ... compost the shell instead of sending it to the landfill. 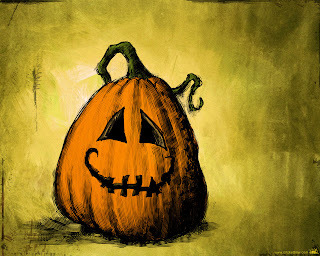 Question: How do you mend a broken Jack-O-Lantern? -Are you planning a party for your little ones? Send email invitations rather than the "snail mail" variety. There are a lot of seriously spooky e-cards on the Internet. Use re-usable plates, cups, utensils, napkins and tablecloths. Paper party goods can be expensive and just add more clutter to our nation's landfills. Serve some healthy, fun treats that aren't individually wrapped ... popcorn, apples, fruit leather (in the shape of worms and snakes) and ghostly cookie skeletons. Check your closets for "retro" clothing (got any old "hippie" duds? Cool, dude!). Pull out costume jewelry ... little princesses, gypsies and pirates love "bling". Hats of any kind can "top off" an outfit. Shop at Goodwill ... they have not only organized merchandise into a special Halloween section but also offer some creative costumes ideas made from second-hand garb. These are just a few ideas. I'm sure that with a little thought ... you can conjure up a few of your own. OK ... one more ... then I'll stop ... I promise! Question: What is a pumpkin's favorite sport? Welcome to the first Friday of the month and another vegan recipe. I post recipes on Reduce Footprints, once a month, because eating meatless meals is one of the easiest ways to walk gently on the planet. Good food that is good for the environment and our health ... what could be better! This month's recipe comes from ... me! We enjoy it, with homemade rustic bread, for dinner. I hope you and your family enjoy it as well. Toss everything, except the salt & pepper, into a soup pot and cook for approximately 90 minutes. Add salt and pepper as required and continue cooking for another 30 minutes or until beans are cooked. This is a very versatile soup. For a heartier dish try adding cubed potatoes (1 medium), quinoa, pasta, or rice (a small amount ... about 1/4 cup). If you like a zestier soup, add cayenne pepper or experiment with different hot peppers. One can substitute veggie broth for the bouillon cubes & water. Check the air pressure in your tires. Cooler temperatures lower tire pressure and that, in turn, lowers fuel efficiency. So check your tires and make sure that they are properly inflated. If you have a garage, park the car in it. As the weather gets colder, using a garage will alleviate the need to warm up the car before driving ... and will save fuel. Clean and test the furnace. Did you know that your furnace needs cleaning? Yep ... it collects all kinds of dust and debris which not only affects it's performance but could cause a fire. Before you really need the heat, get out your owner's manual for instructions on how to clean it. No manual? Check here or call a furnace maintenance company. If you have a gas furnace, have it professionally inspected once a year. Move furniture or any obstructions from vents, baseboard heaters, registers on the floor or radiators so that air moves freely. This is also a good time to vacuum these areas to remove any dust or debris. And here's a tip if you have a radiator ... place a reflecting panel behind it ... you can purchase one at a home center or make one yourself with a plywood panel and aluminum foil. Remove window air conditioners for the winter. If they can't be removed, seal them with caulking or tape and cover them with an airtight, insulated jacket. Vacuum the refrigerator coils to keep the compressor running efficiently. It's also a good time to check that the refrigerator is level ... the door should automatically swing shut instead of staying open. Check the seal on the door ... try closing it on a piece of paper. If you can pull the paper out easily, it's time to replace the gaskets. Repeat this process at several spots along the door to ensure that the entire seal is working. Here's another tip for running the refrigerator efficiently ... don't over fill it. Allowing room for cool air to circulate will keep everything at the right temperature. And how about another tip ... plan ahead and defrost frozen items in the refrigerator instead of on the counter top ... the frozen items will help keep your refrigerator cool thus making it run less. Clean the ducts and area behind the dryer. And don't forget, clean the filter after every use and every once in awhile, give it a good wash. Check windows for proper caulking. If you have single-pane windows, add storm windows. Even a plastic film over windows will reduce heat loss. Check doors for weather stripping and replace as necessary. If drafts sneak in under exterior doors, replace the threshold or block the drafts with a rolled-up towel or blanket. Check your roof for any missing or damaged tiles or shingles. Clean the roof gutters and make sure downspouts are pointed away from the house. Now would also be a good time to install a rain barrel ... rather than allow water to drain into one spot, a rain barrel would allow you to direct the water to where it's most needed. Electrical outlets, especially on outside walls, and light fixtures are prime places for cold air to leak into your home. Add foam gaskets behind covers and switch plates, and use safety plugs in unused outlets. Be sure to shut off the power at the fuse box or circuit panel before doing this. Install foam covers over outside water spigots to prevent freezing. Check for water leaks both inside and outside. Wrap the water heater in an insulating blanket. If you have a ceiling fan, reverse the direction ... the fan should be run in a clockwise direction (stand under the fan and if you feel a breeze, reverse the direction so that air is being drawn upwards). This pushes the air up against the ceiling and down the walls, to gently re-circulate the warm air without creating a cooling "wind chill effect." Do you have a fireplace? This is a good time to have the chimney cleaned and get vent systems checked. If your home has no sidewall insulation, place heavy furniture like bookshelves, armoires and sofas along exterior walls, and use decorative quilts as wall hangings. This will help block cold air. Hang a thick curtain in front of the door to block cold air from entering the house. Use a shower curtain rod and loop hangers so that the curtain can be easily pushed to the side to open the door. Bring in any houseplants that have spent the summer outdoors. They'll help clean the air. Hint ... for about a week, bring them in at night and then put them out during the day. This will ensure that they aren't "shocked". Do a little outdoor landscaping. Trees and bushes, planted in the fall, have ample time to develop strong, deep root systems before the heat of the next summer. This increases their chances of surviving and typically means less watering during hot months. For a discussion on fall gardening, click HERE. As the autumn leaves begin to fall, consider raking them up rather than using a "blower" (it's great exercise). Once raked up, use them as mulch to protect plants throughout the winter or add them to a compost pile. Even though fresh, local produce isn't as abundant during this season, there are still many options available. Visit local farms or farmer's markets and find out what's available and then, eat locally and in season. Visit Sustainable Table to learn which crops are growing in your area. Before packing away those summer clothes, go through them and determine which items to keep, which items to repurpose into something else (cleaning rags, craft projects, etc.) and which to donate. Bring out all those warm sweaters, socks, slippers and blankets so that when the temperature falls you'll be ready to bundle up instead of raising the thermostat. Are your kids returning to school? Consider buying clothes, backpacks, etc. from second hand stores and/or thrift shops. If you're buying new items at a store, opt for earth-friendly products and don't forget to pay attention to packaging. Also consider investing in reusable lunch items (beverage bottles, utensils, napkins, etc.) to further minimize your child's impact on the planet. Do your kids ride the bus to school? Often buses sit in front of a school, idling while they wait for kids to climb aboard. Suggest, to your school or the bus company, that bus drivers turn off the engine when waiting for their passengers. And, of course, if it's possible for your kids to walk to school ... all the better (for them and the earth). Speaking of school buses, as the weather gets cooler, there's a tendency to drive kids to the bus stop. To save that fuel, bundle up and walk your kids to the bus stop instead. In the fall entertaining moves indoors. 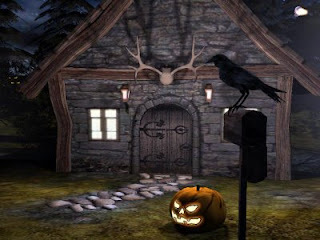 There are football parties, cozy dinner parties and later events like Halloween and Thanksgiving. When planning your fall event, consider reusable plates, napkins and utensils, decorations from nature, clean burning soy candles and plenty of plant-based foods on your menu. Do you have any fall tips that we haven't covered? We'd love to hear them! Welcome to the first Friday Monday of the month and another delicious recipe. 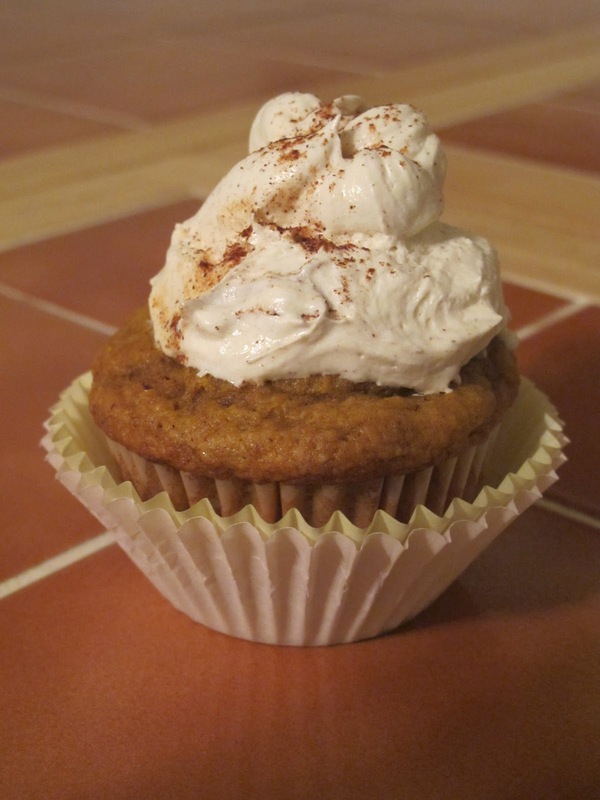 This month we have a real treat ... a recipe from Patty "Sassy" Knutson - the brilliance behind Vegan Coach. When I became vegan, I had so many questions ... about nutrition ... about recipes that were easy to make and tasted good ... about how to make a vegan diet work. So I searched ... and quite frankly the majority of sites that I found talked about animal cruelty and a vegan lifestyle. While the information was important, it was way too much for me. I just wanted to know what to cook, how to cook it and how to get the best nutrition possible. I wish I would have found Sassy back then ... it would have saved me a lot of time! Sassy seems to understand what people, like me, are looking for. The Vegan Coach is a wonderful resource. The recipes are delicious, easy to make and don't require one to search the markets for strange ingredients. But the site is so much more than just recipes ... one will learn about vegan nutrition ... there's information about kitchen tools that will help get a meal on the table easily ... and the site includes something unique called Flavor Matches. Flavor Matches? Yes, Indeedy! Sassy has put together a list of foods that go well together. So, when you're planning a meal or are just tired of the "same old, same old" recipe, check for a flavor match and create something spectacular. The most amazing thing, to me, is that Sassy is involved with her readers. If one has a question, she'll answer it. She interacts through emails and reader participation. One definitely gets the sense that Sassy is a friend. Sassy has graciously offered to share a recipe with us. It looks so yummy ... I can't wait to try it. I hope that you and your family will enjoy it! This is a fun recipe for a lovely brunch or dessert. It combines a cooked vegan crepe with a delicious raw vegan cashew sauce. Yummmmy. Plan ahead! Cashews must soak for 2 hours, crepe batter for 1. Use a crepe pan or a good non-stick frying pan. Soak cashews for 2 hours. After 1 hour, prepare crepe batter. In a blender or food processor, combine all crepe ingredients. Blend for 20 seconds. Do not over process. Allow crepe batter to sit for 1 hour. Heat oven on the lowest temperature. Then turn oven off (we just want to keep the food warm, not cook it in any way). Chop pecans and set aside. Warm blueberries in the oven while you prepare the rest of the dish. When both the cashews and crepe batter are ready, prepare the Vanilla Cream Sauce. Place in an oven-proof bowl and set in the oven to keep the blueberries company. Portion out 2-3 Tbsp. of the batter onto a hot non-stick lightly-oiled pan over medium high heat. Lift and rotate the pan so the batter evenly coats the bottom. Cook until almost dry on top and lightly browned on edges. Loosen the edges with a thin spatula and flip crepe over with your fingers, cooking for an additional 15 seconds. Adjust the heat as necessary. Place a rack on a cookie sheet and place it in the oven where the blueberries and cream sauce are having a party. As you complete each crepe, place on the rack in the oven to keep warm. When all the crepes are prepared, fill each crepe with 2 large Tbsp. Vanilla Cream Sauce and 1 Tbsp. blueberries. Roll up, sprinkle with pecans and dust with powdered sugar. Serve 2 crepes per plate. I'd like to thank Sassy for sharing this recipe with us ... and I encourage you to visit her at Vegan Coach. If you have a vegan recipe which you'd like to share, please email it to me HERE. Find the entire list of all the recipes we've shared by clicking the tab at the top of the page or clicking HERE. I was recently invited to review the new book, Thrive Foods, by Brendan Brazier. If you've followed my blog for any length of time then you know that I've never done a review and I don't typically promote products or services. But when I learned that Thrive Foods is about nutrient-rich foods which promote health and environmental sustainability ... well, I couldn't resist. Let me first give you a little background on the author of this book. Brendan Brazier is a professional Ironman triathlete and a two-time Canadian 50km Ultra Marathon Champion. He is the creator of VEGA (an award-winning line of whole food nutritional products) and is recognized as one of the world's foremost authorities on plant-based nutrition. Thrive Foods begins with a wonderful discussion about nutrition and the environmental toll of food production. One will find out what nutrient density is and why it matters as well as learn how food production affects the environment. Later in the book, the author talks about the key components of good nutrition and which foods will give us those elements. He uses icons to help us easily identify such things as calcium, iron and essential fats. Brendan shares 200 delicious recipes using the most nutrient-rich foods we can eat. We tried the recipe for Eggplant Rollatini ... it was easy to make and tasted wonderful! But it is Chapter 3 that I found most interesting. It is entitled "An Appetite For Change: Environmental and Health Solutions Through Food". In this section, Brendan shares a unique concept in how we look at food and how we measure it's value ... the Nutrient-To-Resource Ratio. In other words, he's measuring how much nutrient gain we receive from a food versus the resources spent to produce it. He looks at resources such as arable land (land fit for the growing of food and which is in a climate conducive for agriculture with soil containing sufficient nutrients to sustain crops), water, fossil fuel and emissions. All of his calculations are presented for the reader to check and double check. You might be surprised to learn how some of your favorite foods fare in this scenario. For example, in the nutient-to-arable-land ratio he compares kale and beef. Remember, this ratio only takes into consideration the arable land and doesn't consider water, emissions, etc. From the book "To gain an equal amount of micronutrients from beef as from kale, 2900 times more arable land would be needed." Wow! Factor in the other natural resources and you'll see that the cost of beef, in natural resources, is huge! So why are hamburgers, meat products and processed foods so cheap in the store if they take so many resources to produce? Brendan explains it to us and talks about government subsidies and how the price of food in the grocery store doesn't really reflect it's value ... if it did, most of us probably couldn't afford those items. In fact, if the grocery store reflected the true cost of a food, we'd probably all eat healthier. I quickly realized that there are hidden costs to food ... costs which affect our taxes, our health and the environment. The chapter finishes up with a chart ... it shows how many equivalent miles driven one would save by switching to a whole-food, plant-based, nutrient-rich diet. If you thought driving less was good for the environment, you'll be amazed at how much good you'll do by changing your diet. Thrive Foods is sure to be a great resource for anyone who cares about their health and about the environment. I know that I'll be referring to it often! I'd like to thank Brendan Brazier and Sequel Naturals for giving me the opportunity to review this book. You can pre-order Thrive Foods (sales begin on September 6th), as well as order Brendan's other books, from his site HERE. Now for some exciting news: Would you like a chance to win a trip for two to meet Brendan at the Alive! Green Expo Lounge, surrounding the 63 Annual Emmy's? Just click on Brendan's Facebook Fan page for your chance to win an amazing trip. And while you're there, sign up for a free PDF download of the intro and 3 recipes from Thrive Foods. I received a copy of "Thrive Foods" in order to write this review. I received no other compensation. All opinions expressed are mine and mine alone and reflect my honest opinion of the material reviewed. Welcome to the first Friday on the month. Typically you'd see a recipe in this spot but ... today I have something exciting to share with you ... my first-ever review. It's going to post in a little while so come back in about 30 minutes for that event. And ... if that weren't exciting enough ... here's some more exciting news. I will be posting a recipe on Monday morning. Our guest chef will be none other than Patty "Sassy" Knutson, Vegan Coach/Author/Nutritional Consultant. I've seen the recipe and Mmmmm ... it'll make your mouth water and is sure to become a family favorite. Okay ... stay tuned .... it's going to be fun!! My favorite day of each month is the first Friday ... that's the day I get to share a fabulous meatless recipe with you ... usually from a fantastic guest chef. So why does a green living blog post recipes? That's easy ... eating meatless meals is one of the easiest ways to walk a little gentler on the earth because, simply put, it takes less resources to produce one pound of plant-based food as opposed to one pound of animal-based food. This month I'd like to introduce you to Nicki. Some of you might already know her as Nicki Woo - The Home Guru. She has been a #CTWW participant and supporter for quite some time. Visiting Nicki's site is pure pleasure. She posts a ton of recipes and each one comes with a delightful story. For example, in this POST you'll find a fabulous recipe for Lemon-Mint Slush along with a great story about a sick child, special "sick" treats and how mom's slushes are more special than McDonald's. Recipes aren't her only "thing" though ... you'll find posts on crafts, like this ONE on how to make an autumn wreath ... or this POST where she makes a buried witch topiary (oh you gotta see it). Sprinkled liberally throughout her blog, one will find photos of her beautiful family. But we're here to talk about recipes, right? Nicki shares her culinary expertise with recipes such as Chicken Lo Mein, Beef and Broccoli Stir Fry and Alligator Gar Balls. WAIT A MINUTE!!! THESE AREN'T VEGAN!!! Nope ... Nicki is a "sometimes vegan", proving once again that one can make a difference with occasional meatless meals. She has graciously agreed to share one of her vegan dishes with us. She chose this recipe because, in her words, "... in a few short weeks, summer will be ending and we all could use some good weeknight recipes that satisfy and are quick to make from pantry items". So ... check out this recipe and then head on over to Nicki's place and browse around ... I know you'll love it there! Prepare Macaroni according to package directions. Be sure to salt the water. In a large skillet, over medium heat, heat olive oil. Add "Beef" crumbles and onion and cook for 3-5 minutes, or until the onion is translucent. Add Chili powder, stir, and then add the crushed tomatoes. Cover and continue to simmer on low while you make the "cheese" sauce. To make the "cheese" sauce, place another pan on low heat. Add margarine and allow to melt. In a separate bowl, add the flour to the cold soy milk and whisk to combine. Slowly pour the milk mixture into the pan with the butter, while whisking continuously to prevent lumps. Sprinkle in garlic powder, continue to whisk allowing the sauce to thicken. Remove from heat. Combine macaroni, "cheese sauce" and "beef" tomato mixture. Season with salt and pepper and serve! Also great warmed in the oven at 350 F for 15-20 minutes, and then sprinkled with Vegan Cheese. Total Comfort Food! I'd like to thank Nicki for sharing that delicious recipe with us. If you have a vegan recipe that you'd like to share, please email it to me HERE. And for all the recipes we've shared on this site, please click the tab at the top of this blog. What if you could prepare a meal that is delicious, healthy and Eco-friendly? Sounds like the perfect scenario, doesn't it? Well, good news ... it's absolutely doable! We know about foods that are delicious and healthy but ... how does one make their meal "green"? Easy ... make it meatless. Plant-based foods take far fewer natural resources to produce than animal-based foods. With recipes like the one we're going to share today, you won't be thinking "vegan" ... you'll just be thinking "mmmmm". Is your mouth watering yet? Mine too! Justin has very kindly agreed to share one of his recipes with us. I hope you will enjoy it! Bring your broth up to a roiling boil. Cook the carrots in the broth until just tender. This will take about 30 seconds to a minute. Using a spyder, fish the carrots out of the broth; repeat the same process with the broccoli, and then cook the noodles in the broth until tender. Remove the noodles from the broth and reserve the broth. Place the noodles in a bowl. 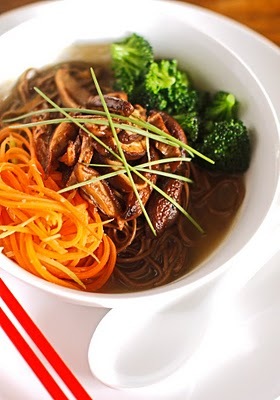 Top on one side with carrots, the other side with broccoli, and in the center, add the mushrooms. Pour about a cup and a half of the hot broth over the noodle bowl. Garnish the dish with chives, hot sauce, and a little soy sauce. Turn on your vent hood -- this recipe creates a bit of smoke! Heat a medium-sized pan over high heat and add the sesame oil. Once the oil starts to smoke, throw the mushrooms in and toss them around. Allow them to cook for about a minute before removing the pan from the heat. Add the smoked salt, soy and mirin. Set mushrooms aside. I'd like to thank Justin for sharing this fabulous recipe with Reduce Footprints. For all of the recipes that we've posted on this blog, please click HERE or use the tab at the top of the page. If you have a vegan recipe which you'd like to share, please send it to me HERE. And stay tuned for more recipes ... we post them on the first Friday of each month. Lawn mowers as we know them were introduced to the masses in the early 1800s and were powered by people or animals. Eventually gasoline and electric versions made their way onto the market and the old style manual “reel” or push mowers got lost in junk yards or the dark corners of basements. In retrospect the transition made sense since using gas or electric made everyone’s lives easier when it came to cutting large lawns or trying to mow over tall grass. However, in recent years sheer practicality is bringing back the manual reel. Meanwhile, grounds for switching back to manual mowers or at least having one as an option can further be justified through two other very important issues: curbing pollution and personal safety. Did you know the level of emissions released over time by gasoline powered mowers for personal or commercial grounds maintenance can eventually equal what automobiles emit over hundreds of miles? Also, fumes or oil spills can poison grass or other plant life in the yard much like it harms vegetation along busy streets. For these reasons and more the US Environmental Protection Agency has been setting new restrictions for small lawn equipment hoping to reduce the environmental impact. Still, next to wearing a gas mask the best way to not breathe in fumes while mowing the lawn is to use a manual mower. Alternatively, noise is another type of pollution motor powered mowers cause. A gasoline or electric powered mower engine produces enough racket to affect our hearing and sour relationships with neighbors, especially if the lawn is mowed at the wrong time of day. With a push mower it’s easy to listen to music and if necessary mow the lawn at six in the morning without making enemies. Despite there being various sources calculating the annual amount of people injured in lawn mower accidents its clear those numbers are around 100,000 or higher, many children included. It’s also a fact that negligence is only part of the story as most of these accidents are related to the engine’s powering of high speed blades. In an instant they can cut up many hard substances sending pieces flying like shrapnel. Electric models themselves have separate issues, as extension cords often get run over or tangled up causing damage to other things in the yard. With gas powered mowers the fuel is a hazard and homeowners have been known to throw out their back trying to start them up. The bottom line: When it comes to safety there can be no compromising. That’s why although the powered mower is convenient and great for big jobs whenever possible the manual mower should be put to use. Jakob Barry writes for Hometalk.com, a growing community of homeowners and contractors getting the most from their resources by sharing and monitoring projects together. He covers various eco-friendly home improvement topics including Green landscaping and lawn services. Turn your A/C thermostat to 75 degrees or higher. Better yet, don't use it at all. Use ceiling fans. Adjust them so that they run in a counter-clockwise direction (stand under the fan and if you feel a breeze, it's set correctly). Use box fans or small space fans to help circulate air. And here's a tip ... when it's cool outside, put a fan in the window facing in and blow cool air into the room. When it's hot inside, reverse it ... put a fan in the window facing out and blow the hot air outside. It works amazingly well. Adjust the curtains and windows. Open them when it's cool and the sun isn't shining in. When the sun comes around, close both the windows and the shades. Turn off all electrical devices when not in use. For example, when you're not using the computer, turn it off ... you'd be surprised at how much heat a computer puts out (there's a reason there are little fans inside of computers). And don't forget lights ... they generate quite a lot of heat as well. Eat local and organic. Summer is the perfect time to eat fresh, local, organic produce. Support farmer's markets, CSAs and roadside stands. Or, start a garden and grow your own. Get some exercise and leave the car at home. This is the perfect time of year to walk or ride a bike ... so give the car, and our air, a break. Are you planning some landscaping this summer? Be sure to opt for native plants ... they'll require far less water and fertilizer. When mowing lawns, use a push mower instead of the power version. Does your deck, patio or walkway need cleaning? Sweep it instead of using a vacuum, blower or hose. If you use large appliances like dishwashers, clothes washers and dryers ... operate them either early in the morning or late at night ... you'll not only save money by not running them during peak hours, you'll save energy. Consider using a clothes line and make use of the sun. Going on a picnic? Be sure to use reusable dishes and utensils ... no paper plates or plastic forks. And don't forget cloth napkins instead of paper. When the picnic is over, be sure to clean the area ... leaving nothing but your footprints. Carry a reusable water bottle with you instead of buying bottled water. Opt for counter top cooking rather than using an oven ... toaster ovens and crock pots make wonderful meals without using a lot of energy. Are you planning a vacation? Consider a "staycation", playing tourist in your own town. If you decide to leave town, check out this post first: Vacations - The Eco-Friendly Way. When buying typical summer products (sun lotions, swim suits, pool toys, etc.) be sure they are Eco-friendly. Forgo expensive souvenirs and take digital photos instead. If you really want a souvenir, consider something from nature ... a rock or piece of driftwood. Start a compost bin ... summer is the perfect time for composting. Planning a little hiking or camping this summer? Remember to carry out what you carry in ... no littering. In fact, it's a pretty good rule for any activity, anytime. With just a little effort, any season can be Eco-friendly ... and wonderful! Happy Summer (or Winter) everyone! Happy Friday Everyone! We haven't done a film fest in awhile so ... sit back, relax ... and enjoy! It is my favorite day of the month ... the first Friday of the month when we share a delicious recipe. You might be wondering why a blog about "green" living posts recipes ... well, simply put, meatless meals are Eco-friendly because it takes far fewer resources to produce one pound of plant-based foods versus animal-based foods. So, it's an easy (and tasty) way to walk a little gentler on the earth. I'd like to introduce you to Kristi, the brilliant author of Veggie Converter 365. This site is a bit different from other recipe sites which I've shared ... this one takes family favorites, usually made with meat, and converts them to vegetarian/vegan versions. You'll find marvelous dishes such as Spicy Rice Balls, which can be fried or cooked in a crock pot and which can be made ahead and frozen. How about Beefy Tacos or, for a more elegant dinner, Beef Wellington. Sounds good, doesn't it? Kristi also helps us out with vegan substitutes ... on this PAGE, you find substitutes for ham, eggs, gelatin, etc. It's a wonderful resource! Today Kristi has kindly agreed to share one of her recipes with us. It looks delicious ... I hope you'll give it a try! Hello to Reduce Footprints readers. 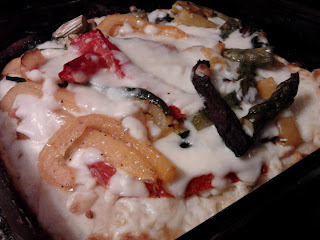 I'm so happy to share a vegan recipe with you: a delicious throw-every-veggie-in-the-oven pizza. You could make this with just about any combination of vegetables your family likes. Par-bake crust at 400 for 20 minutes. Place all vegetables on a cookie sheet. Drizzle with olive oil and sprinkle with House seasoning. Bake at 400 for 30-40 minutes, flipping vegetables once about halfway through. Top pizza crust with additional olive oil, veggies and "cheez," if desired. Bake at 375 for 20 minutes or until cheese is melted. This pizza is excellent with or without the "cheez." I think I actualy prefer it without the cheez. 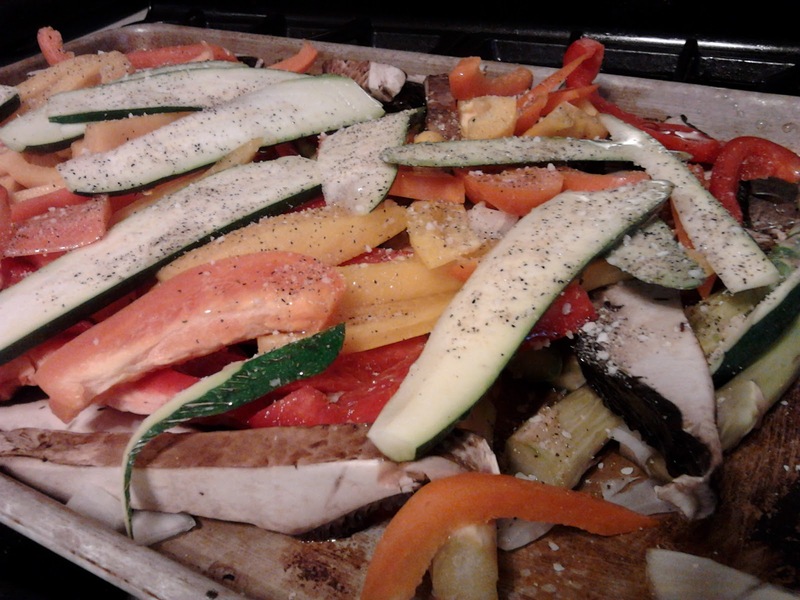 The roasted veggies really shine when on their own. I'd like to thank Kristi for sharing this delicious pizza recipe with us. If you have a vegan dish that you'd like to share, please send it to me HERE. As always, you can find all of the recipes we've posted by clicking the tab at the top of the page or clicking HERE. Happy Eating!! When it comes time to crank up the cooling power of your ac system this summer there are some things to consider in addition to simply keeping your family comfortable! Given the state of the world and environment there is no shortage of people that are interested in getting the best efficiency out of your ac unit. While these are similar whether you are a home owner with a central air conditioning system or use a portable / window air conditioner to stave off the heat, there are some differences so I will touch them separately. Given that the average US home will spend $1,000 in cooling costs this summer it can help your pocket book significantly in addition to helping the environment. Perhaps no piece of HVAC equipment has undergone a larger improvement in efficiency in the past decade than the central air conditioner. What was common to be an 8-10 SEER unit the last time you bought an AC system, you can find units up to 20+ SEER these days. This is one way to get more cooling for your utility dollars. To be fair this would involve scrapping a unit that maybe already works, but it is a way to use less energy. The best ways to get the most out of a central AC unit without replacing are to ensure that there is nothing stopping airflow. If you have a air filter that is more than a month old you likely need to replace it. In addition, your outdoor condenser tends to gather debris on the outside and should be cleaned with either a hose or an air compressor. Doing just these can have a significant impact on your energy usage this summer. Much like a central AC system, the efficiency of newer models is much better than the older units that many have. If you have the money to spend this is a great way to lower your footprint. Again, to be fair you would be adding another unit to our landfills so it isn’t a complete win-win situation. Make sure you get R410a as the refrigerant, it is quite a bit better than the old R22 which some units still use. Thankfully there are also ways to ensure that your portable or window unit gets more bang for its buck. With a portable system finding a way to get the exhaust air to the outside of the room your cooling is paramount. Often a hose leading outside it preferable. Another great way to conserve energy is to cool only the areas you are in at the moment. As opposed to cooling the entire house or apartment, cool only the room that you are in. With a window unit, similar to a central ac system, you need to make sure that the outside part of the AC unit is clean of debris which will sap more energy. When it comes to staying cool and conserving energy you can see there are some ways to go about lessening your footprint on the world. Try a few this summer and reap the benefits. Darin Hansen is an HVAC veteran who has seen just about every side of the HVAC business from web wholesaler to the manufacturing floor. You can read more about all things HVAC related on his site including a long list of HVAC reviews from just about every major manufacturer. I love the first Friday of each month ... that's the day we discover a new recipe ... not just any recipe but one which is delicious and Eco-friendly. Eco-friendly?? Yep! The fact is that it takes less natural resources to produce one pound of plant-based food as opposed to meat-based food. Who knew that good food could also be good for the planet! In February I introduced you to my bloggy friend, Tiffany, of Live. Learn. Love. Eat. She thrilled us with Italian Rice and Black Bean Stuffed Peppers. Today she is graciously sharing two more recipes with us. I can't wait to try them! Preheat oven to 375F. Cut the tofu width-wise into 1/4 inch slices and then cut each slice in half to make little nuggets. In a small bowl, whisk together the milk, Dijon and nutritional yeast. In another small bowl, place the breadcrumbs, garlic powder, dehydrated onion flakes, sage, salt and pepper. Dip each nugget into the milk/Dijon mixture and then coat in the breadcrumb mixture. Place on a baking sheet and bake for 15-20 minutes, until golden and crispy. Boil the macaroni as directed. 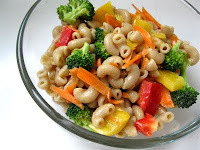 While the macaroni is boiling, prepare the dressing by whisking all the dressing ingredients together in a large bowl. Then cut up the broccoli, dice the pepper and peel and grate the carrots. Add the vegetables to the dressing. Drain the macaroni and run under cold water to cool, then add to the large bowl with the dressing and vegetables. Stir and eat as is or refrigerate for later. For more fabulous recipes, please visit Tiffany at Live. Learn. Love. Eat. And take a look at all of the recipes we've shared on Reduce Footprints using the tab at the top of the page or by clicking HERE. Whether it's a spring or summertime gathering, you can easily plan and create a Green party. From venue, to invitations, to the food you serve and what you serve it on, you may reduce the carbon footprint by cutting on waste and resource consumption - all while entertaining your guests in style! Choose a few or all of the tips below to Green your warm-weather parties! Instead of sending out expensive and seldom recycled party invitations, try going virtual. Sending invitations via email is eco-friendly as well as cost-effective. Save money and reduce paper waste by using Paperless Post, Evite, Sendomatic, or a similar online invitation service. If you want a more traditional approach, try using party invites made from recycled paper. Send out cards made of natural paper, soy ink, and natural embellishments like flowers, twigs, and leaves. Make sure to only buy supplies you need and will use to prevent waste. Choose daytime outdoor events. They typically use less energy than indoor evening events. But if you're having it at dinner, keep your space lit with Green lights. Switch all bulbs to CFLs and LEDs and save a dramatic amount of energy compared to traditional incandescent light bulbs. Make sure your location is easily accessible, and encourage attendees to carpool, bike or walk. Provide information about public transportation options. Party favors can be eco-friendly and reusable. Try giving away a T-shirt, a stainless steel water bottle, potted herbs or fair trade chocolates. If you prefer homemade party favors, consider baking cookies or brownies in decorative containers. Remember, it's the thought that matters and guests will be impressed either way. Always use recycled wrapping paper when giving gifts or party favors. Fabric gift bags are crafty ways to present party favors, too. Giving eco-friendly party favors to guests can encourage them to go Green themselves. When considering decorations, avoid plastic tablecloths and use paper or cloth. Consider natural decorations that are biodegradable or reusable. Examples are interesting succulents, flowering plants, stones, and bare branches decorated with ornaments or ribbon. Always buy locally. Every time something is shipped, a truck or plane burns fuel to get the item to you. Therefore, buying locally is one excellent way to be eco-friendly! Serve from a local and organic menu when possible, and offer a vegetarian option. Buying from local vendors at farmers' markets cuts back on carbon emissions because fewer miles traveled from farm to table means fewer emissions produced from the vehicle transporting the food. Also, try to buy foods produced organically and look for seasonal items to save money and get the best produce available. To avoid waste, be careful not to overbuy. Arrange with a local food bank to pick up leftovers at the end of the party. Offer fresh juice as a refreshing drink or fill cups with some fancy organic beer. Beer brewed with organically harvested barley and hops is tastier and better for the body. Avoid plastics and non-recyclables. Skip individual plastic water bottles and juice boxes. Drinks in aluminum, glass or plastic containers are recyclable. Or large reusable water dispensers can be used for water or to mix frozen juices. Use reusable serving dishes, plates, cups, and utensils - it's the Greenest option. If using disposable food ware, make sure it's compostable or made with recycled content, like paper plates made from recycled paper. Eco-friendly piñata: Use a paper bag and newspaper to make a Green pinata. Fill it up with organic lollipops, organic apple bars, organic raisin packs and organic chocolate balls that were wrapped in Earth print foil! You can make the goodies too - it all depends on the time you have. Olympics: Set up a series of fun activities including relay races, jump rope and kickball. For treats, hand out organic cookie "medals" or energy bars such as Clif Zbar. Backyard Eco-camping: Start the party at dusk. Set up tents in the backyard, tell spooky stories, gaze at the stars and identify constellations. For treats, have your guests make their own organic s'mores and trail mix. This spring or summer, reduce unwanted waste and impress friends with a festive Green party. Plan an eco-friendly bash that will save money and the environment! Renee Bedford is a mom and wife who believes in teaching her children to be self-reliant and prepared. She knows that not only will these skills keep them safer, but they will also make them smarter! Besides being a committed mother, she also works for the Christmas Tree Market, where they sell an array of classic and unique artificial Christmas trees. Reflect on the beauty and power of nature. Consider everything we get from the earth. Go for a walk near your home and notice what's beautiful around you. Consider organizing a walk for people from your community. WE'RE CHANGING THE WORLD ... ONE CHALLENGE AT A TIME! It's the first Friday of the month and that means it's time to share another vegan recipe. This month I'm sharing my favorite cornbread with you. This recipe is so easy and produces a delicious, cake-like bread. We like it with a bowl of chili or thick soup. I hope you enjoy it! Adjust oven rack to middle position; heat oven to 425 degrees. Spray 8-inch-square baking dish with nonstick cooking spray. Bring the water to a boil in a small saucepan. Add the ground flax seed, reduce the heat to medium-low, and simmer the ground flax seed in the water for 3 minutes or until thickened, stirring occasionally. Set aside. In a medium bowl, whisk together the flour, cornmeal, sugar, baking powder, and salt until well-combined. Add the ground flax seed mixture, soy milk, and canola oil to the flour mixture. Beat just until smooth (do not over beat). Turn into prepared baking pan. Bake for 20 to 25 minutes, or until a toothpick inserted in the middle comes out clean. Cool on wire rack 10 minutes, invert cornbread onto wire rack, then turn right side up and continue to cool until warm, about 10 minutes longer. Cut into pieces and serve. For a delicious twist, try using coconut milk instead of soy milk (we like Silk brand). Rather than boil the water, I simply grind the flax seed in the blender, add the water and continue to blend for about a minute until it thickens. If you have a vegan recipe which you'd like to share, please send it to me HERE. All of our featured recipes can be found by clicking the "Vegan Recipe" tab at the top of this blog or by clicking HERE. What’s stopping us from being greener? Writing a blog about green living is hard! Let's face it, while the message is worthwhile, it's tough to talk about environmental issues without sounding like a "broken record". So, when I found It's Not Easy To Be Green, I was thrilled. Jennifer, the creative force behind the blog, brings a fresh new voice to Eco-living. She speaks with an incredible honesty, sharing her views in posts such as Can Good Intentions Save the Planet and the delightfully inquisitive Does Going Veg Make Your Tastebuds Mutate. Sometimes Jennifer's articles make me a little uncomfortable because they push me look deeper into my own heart and help expose those areas where I could do better. She tackles every subject head on ... and in the process she opens her readers' eyes. When it comes to greening our lives, we are highly selective. We accept some of the suggestions we come across and reject plenty of others. I was perfectly happy to embrace cloth dish rags instead of paper towels, but the idea of cloth toilet paper continues to gross me out. It was this inconsistency that made me think: what's stopping me from doing other things I know I could be doing to reduce my impact? Where am I drawing the line, and more importantly, why am I drawing it there? From the comments on a recent post I wrote about bulk bins and how to use your own containers, I've begun to suspect that the barriers that keep us from being greener are sometimes very small. It's true that we do have real limits on our time, energy, and resources, but in the case of the bulk bins, it was my dislike of having to ask questions that kept me from bringing my own jars instead of taking plastic bags. For a blog friend, it was a single awkward encounter with a checkout clerk. After taking a long look at all the things I know I could do but choose not to (ride a bike, compost indoors, join local green committees, etc. ), I came up with the following list of lame hang-ups that derail my greenest intentions. Squeamishness. Not so much a fear of germs as a dislike of dirt under nails, creepy crawly things, and my own identity as a biological being. Hating to talk to strangers. I am more introverted than some of the kids with Asperger's that I've worked with. Enough said. Dislike of changes to routine / inconvenience. I finally figured out why I don't like loose tea, which I can get packaging-free from the bulk bins: my tea ball is fiddly and difficult to use, especially in the early morning when hand-eye coordination is proving elusive. Kneejerk reaction. Like the one I had when someone first mentioned composting toilets. (I believe my exact reply was, "You can take my flush toilet from my cold, dead hands.") I have since realized that composting toilets are essentially litter boxes, one of which I clean every day and have no major issues with. Of course, being able to identify a hang-up isn't the same thing as doing something about it. But seeing the things you choose not to do as a problem means that you can start looking for solutions or alternatives. At the tutoring center where I work, we teach a ridiculously simple problem solving strategy that goes: 1) identify the problem, 2) brainstorm possible solutions, 3) pick one to try, 4) evaluate how well it worked, and 5) try another solution if necessary. It seems totally obvious, but I've found that it really does help me wrap my head around things, from cloth pads to reusable produce bags. It's easy to think, "I'm already doing so much for the environment, I don't need to do everything," but that shouldn't keep us from pushing ourselves to keep making more changes. It's not easy to be green, after all. What are your green hang-ups? How could you get around them? 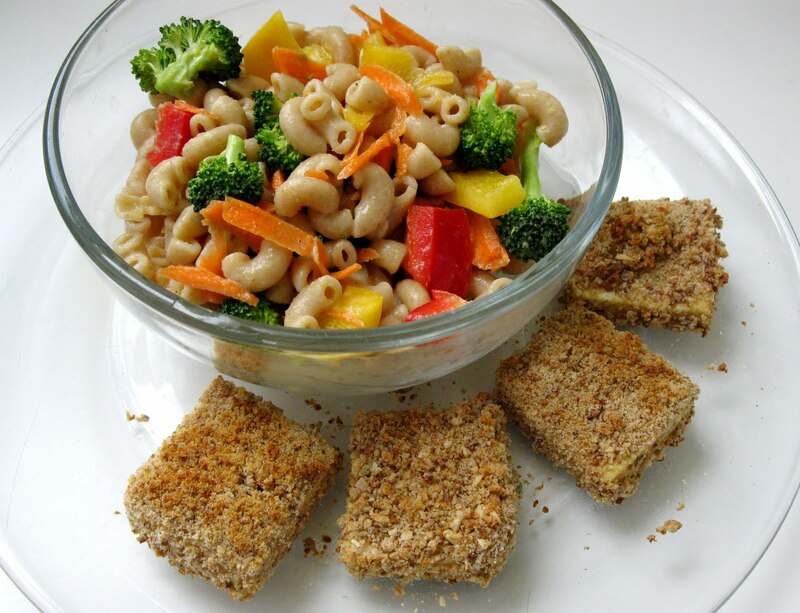 It's the first Friday of the month and that means it's time for a delicious vegan recipe. Are you surprised to find a vegan recipe on a "Green" site? Well, consider this statement which I recently read on Wikipedia in an article entitled Environmeantal Effects of Meat Production: "According to a 2006 report by the Livestock, Environment And Development Initiative, the livestock industry is one of the largest contributors to environmental degradation worldwide, and modern practices of raising animals for food contributes on a "massive scale" to air and water pollution, land degradation, climate change, and loss of biodiversity." Simply put ... it takes less natural resources to produce plant-based foods than it does animal-based foods. This month's recipe comes from one of my all-time favorite sites, Cooking Rut. You might be surprised to learn that Cooking Rut isn't a vegan/vegetarian blog ... it's a cooking site which includes something for everyone. The owner and "top chef", Marcy, offers delicious recipes like Falafel and Chile Relleno. In a series of posts called Culinary School Friday, you'll find very informative articles, such as All About Flour. In another post (and one of my personal favorites), Potatoes, Explained, you learn all about the different varieties of potatoes and how to use them. But that's not all ... in every post you'll find Marcy's unique sense of humor and joy in cooking. Greetings from a faraway land called Montana. Small Footprints asked me to provide a vegan recipe. I have many recipes, most of which are not vegan. I’m what you call a “flexitarian.” You know… one of those people who eat vegetarian on cool days of the week like Meatless Mondays or Tofu Tuesdays. But this brings up a question (I have many)… why doesn’t every day have a cool “veggie” name? I can come up with a few: “Sans meat Saturdays,” Salad Sundays,” or “Fennel Fridays.” And why are flexitarians only supposed to eat vegetarian meals on Mondays and Tuesdays? I tend to plan meatless meals during the week and not necessarily on Mondays and Tuesdays. 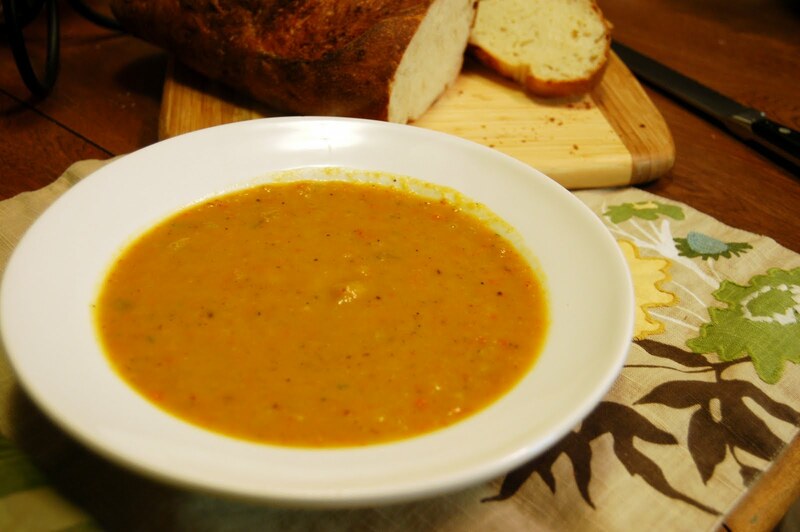 Anyway… Here is a simple, vegan recipe for Roasted Butternut Squash Soup. It’s one of those simple soups with just a few ingredients. It’s important to note that when making recipes with a small list of ingredients, that you pay attention to quality. For instance, you want a good vegetable stock (homemade preferably), freshly ground black pepper, and sea salt (or Kosher… but definitely not iodized). Also, if you can, be sure to buy locally/organically/sustainably grown vegetables. Using high quality ingredients will set your cooking apart from the rest. Place the carrots and squash on a baking sheet. Drizzle with olive oil and sprinkle with the salt and pepper. Toss together to distribute the oil and seasonings. Bake in the hot oven for 10 minutes. Remove from the oven and toss in the leeks and garlic. Roast for another 15 minutes or so or until the carrots and squash are tender. In the meantime, heat the stock on the stove. When the vegetables are done, puree them in a blender or food processor. If using a blender, you will need to add some of the stock to the vegetables and you will probably need to work in batches. The amount of stock used depends on how thick you want the soup. I like thick, hearty soups, so I add around 2 cups of stock. Others may like it thinner… it’s up to you. Adjust the seasonings with the salt and pepper. Add a pinch of ground cayenne pepper (or ground ancho pepper) for a little heat and to counteract the sweetness of the squash. If you want a super-smooth soup, push the pureed soup through a strainer to remove the solids. Serve with crusty bread or croutons. Doesn't that sound yummy? I'd like to thank Marcy for sharing this delicious recipe with us. If you have a vegan recipe which you'd like to share, please send it to me HERE. Hungry for more? Check out all of our vegan recipes HERE.